Sister Limétèze Pierre-Gilles, SSND, professed perpetual vows before School Sisters of Notre Dame, family and friends gathered on June 18, 2016, in the chapel at Villa Assumpta in Baltimore, Maryland. She chose Jesus’ foot washing as the gospel for the Eucharistic celebration. 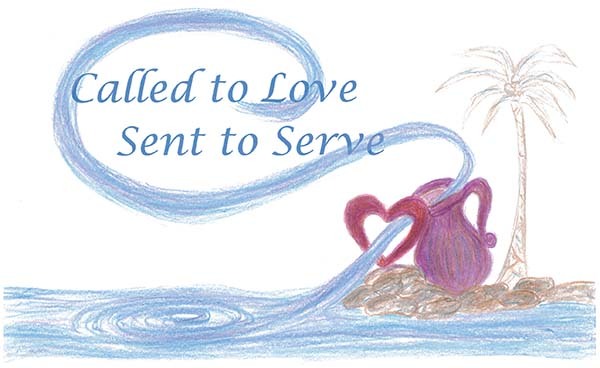 The jug, the water, the palm tree and the words, “Called to Love, Sent to Serve,” (pictured above) are surely her baptismal mission and her good news. Such good news calls all of us – religious, single or married – to renew our vows. Love animates the waters as they flow into the pitcher used by Jesus at the Last Supper. The waters flow through the open heart to Sister Limétèze and into the ongoing stream of mission and ministry as expressed in You are Sent (the SSND constitution) and Love Cannot Wait (the SSND directional statement). The waters plunge into the contemplative depths of the heart of God and continue their lifelong journey. The pitcher rests against the supportive rocks of community, family, friends and ministry partners. The palm tree proclaims Sister Limétèze’s roots and heritage as a Haitian woman.